People living near nuclear plant sites shout slogans during an anti-nuclear protest in New Delhi, Thursday, December 8, 2011. 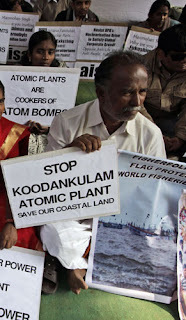 The Kudankulam power plant in Tamil Nadu threatens to derail the entire nuclear energy process of the country. Thousands of residents protested against the N-plant while hundreds went on a hunger strike. While the government looks to be successfully suppressing it, the reactions of people living around other proposed mega nuclear plants remains uncertain. With the post-tsunami Japan nuclear scene going for a toss, the world has suddenly become very N-wary. The nuclear establishment of India will have to tread very carefully and if there’s even a minor mishap from now on, you can be sure that the people will come on the streets.